The Climate Necessity Defence for criminal acts to impede the lawful business of the fossil fuel industry cannot be justified. The acts will never of themselves have a significant impact in constraining global greenhouse emissions. In any event, there will always be more than sufficient proven fossil fuel reserves in countries out of the reach of any activist action, or even Government-backed action, to constrain aggregate cumulative fossil fuel emissions to anywhere near the levels commensurate with constraining temperature to 2°C of warming. What it does do is impose immediate harms on the actual victims of the crimes, and harms on the countries in which the crimes are committed. Some of the harms are from benefitting non-policy countries who produce fossil fuels. The conviction last week of climate activist Michael Foster is a clear case study. The New York Times reports (hattip GWPF) on the conviction by the North Dakota Supreme Court of Seattle resident Michael Foster. Foster took part in effort on Oct. 11, 2016, to draw attention to climate change by turning off valves on five pipelines that bring Canadian oil south. Foster targeted the Keystone Pipeline in North Dakota. Other activists targeted pipelines in Minnesota, Montana and Washington state. A jury in North Dakota’s Pembina County on Friday convicted Foster after a weeklong trial of criminal mischief, criminal trespass and conspiracy. He faces up to 21 years in prison when he’s sentenced Jan. 18. The man who filmed his protest action, Samuel Jessup of Winooski, Vermont, was convicted of conspiracy and faces up to 11 years. What I found interesting was the next sentence. Foster had hoped to use a legal tactic known as the climate necessity defense — justifying a crime by arguing that it prevented a greater harm from happening. The basic idea behind the defense — also known as a “choice of evils,” “competing harms,” or “justification” defense — is that the impacts of climate change are so serious that breaking the law is necessary to avert them. Foster had his action filmed, shown from 2.07 here. Keystone Pipeline. North Dakota. I’m Michael Foster. In order to preserve life as we know it and civilization, give us a fair chance and our kids a fair chance, I’m taking this action as a citizen. I am duty bound. This was a significant action. The video quotes Reuters news agency. Was this action “preserving life as we know it“? In shutting down the pipeline, (along with four pipelines others in the coordinated action) 590,000 barrels of oil failed to be transported from Canada to the USA that morning. It was merely delayed. If the pipelines are working at full capacity it would maybe have been transported by rail instead. Or more produced in the USA. Or more imported from the Middle East. But suppose that those 590,000 barrels (83000 tonnes) had been left in the ground, never to be extracted, rather than delaying production. What is the marginal difference that it would make climate change? From the BP Statistical Review of World Energy 2016 (full report), I find that global oil production in 2015 was around 92 million barrels per day, or 4362 million tonnes in the full year. Global production would have been 0.6% lower on Oct. 11, 2016 or 0.002% lower in the full year. Yet there is plenty of the stuff in the ground. Proven global reserves are around 50.7 years of global production. Leaving 590,000 barrels in the ground will reduce proven reserves by around 0.000038%. That is less than one part in a million of proven oil reserves. Yet in the last few years, proven reserves have been increasing, as extraction techniques keep improving. This despite production climbing as well. 2015 production was 21% higher than in 2000 and 56% higher than in 1985. Proven reserves in 2015 were 30% higher than in 2000 and 112% higher than in 1985. I have divided up those 50.7 years of reserves by major areas. The effect of turning off the oil pipeline is posturing unless it shuts down oil production in Canada and the USA. But that would still leave over 40 years of proven reserves elsewhere. Are Russia and Middle Eastern countries going to shut down their production because of the criminal acts of a few climate activists in the USA? But oil is not the only major fossil fuel. Production of coal in 2015 was 3830 Million tonnes of oil equivalent, 88% of oil production. Proven coal reserves are 123 years of current production. Further, if oil prices rise to the levels seen over the last few years, it will become economic to convert more coal to liquids, a process which consumes four to five times the CO2 of burning oil. Are China, Russia, India, Australia, Ukraine, Indonesia, South Africa and many other countries going to shut down their production because of the criminal acts of a few climate activists in the USA? The third major fossil fuel is gas. Production in 2015 was 3200 million tonnes of oil equivalent, 73% of oil production. Proven reserves are equivalent to 52.8 years of current production levels. The reserves are slightly more centralized than for oil or coal. Like with oil, a large part of available reserves are concentrated in Russia and the Middle East. Leaving 590,000 barrels in the ground would reduce proven reserves of fossil fuels by around one part in ten million. The 50+ years of proven reserves of oil and gas, and 120+ years of proven reserves of coal needs to be put into a policy context. The IPCC AR5 Synthesis Report gave a very rough guide to how much CO2 (or equivalent greenhouse gases) could be emitted to limit warming to less than 2°C. From 2012 it was 1000 GtCO2e. With emissions in 2011 at around 50 GtCO2e, that gave 20 years. From next year that will be less than 15 years. The recent paper “Emission budgets and pathways consistent with limiting warming to 1.5◦C” (hereafter Millar et. al 2017) reevaluated the figures, with the 1.5°C not being breached for a further 20 years. Whatever way you look at the figures, most of the proven fossil fuels in the world will have to be left in the ground. That requires the agreement of Saudi Arabia, Russia, Iran, Iraq, Qatar, Kuwait, Turkmenistan, China, India, Venezuela, alongside USA, Canada, Australia and a large number of other countries. Further, there can be no more extractions of fossil fuels from unproven reserves, which will likely exceed the proven reserves. The efforts of Micheal Foster and his mates could incite further criminal acts. But massive lawbreaking throughout the United States, it would still be insufficient in the USA to significantly dent the production and distribution of fossil fuels in the USA. Even if that happened, there are plenty of other countries who would willingly meet the existing demand. All that the action is likely to do is push up the costs of production and distribution in the USA, harming the US economy and the futures of people involved in the fossil fuel industries and energy-intensive industries. It is the aspect of failing to make a significant marginal difference through the action – that is in reducing global greenhouse gas emissions – than renders the climate necessity defense void. Even if large numbers of other actions are inspired by Foster and others, it would still be insufficient to get anywhere close to the constraint in emissions to constrain warming to 1.5°C or 2°C. On a larger scale, even if all major Western economies shut down all fossil fuel production and consumption immediately, it would merely delay by a few years the cumulative aggregate emissions from 2012 onwards exceeding 1000 GtCO2e. It gets worse. A particular case must be decided on the damage caused to the victims of the crime. In this case the owners of the pipeline, the employees of the business, the customers who do not get their oil, etc. If there are beneficiaries, it is the billions of people in generations to come. The marginal difference to the victims of the action is tangible and has happened. The marginal difference to the beneficiaries is imperceptible and even then based on belief in what amount to nothing more than pseudo-scientific prophecies. But given that a shut-down of production in the USA is likely to be met by increased production elsewhere even these future dispersed and speculated benefits are unlikely to accrue. More broadly, if specific people need to have their immediate interests sacrificed for the greater good, surely that is the function of Government, not some wayward activists? In that way the harms could be more equitably distributed. With random acts of criminality, the harms are more likely to be based on the prejudices on the activists. The Climate Necessity Defence is an invalid justification for the criminal actions of Michael Foster and others in shutting down the oil pipelines from Canada into the USA. The marginal impact on reducing greenhouse gas emissions by the action, if they were not made up by increased production elsewhere, is about one part in ten million. But given that most of the global proven fossil fuel reserves are concentrated in a small number of countries – many of whom have no commitment to reduce emissions, let alone leave the source of major revenues in the ground – the opportunity of producing more is likely to be taken up. Further, the harms the activist’s action is immediate, very definite and concentrated, whilst the benefits of reduced climate change impacts from reduced emissions are speculative and dispersed over tens of billions of people. Last week the US Energy Information Administration (EIA) published their INTERNATIONAL ENERGY OUTLOOK 2016. The Daily Caller (and the GWPF) highlighted the EIA’s summary energy energy production. This shows that the despite the predicted strong growth in nuclear power and implausibly high growth in renewables, usage of fossil fuels are also predicted to rise, as shown in their headline graphic below. For policy purposes, the important aspect is the translation into CO2 emissions. In the final Chapter 9. Energy-related CO2 Emissions figure 9.3 shows the equivalent CO2 Emissions in billions of tonnes of CO2. I have reproduced the graphic as a stacked bar chart. The long lifetime of greenhouse gases means that it is the cumulative build-up in the atmosphere that matters most. In its latest report, the Intergovernmental Panel on Climate Change (IPCC) estimated that to preserve a 50% chance of limiting global warming to 2 °C, the world can support a maximum carbon dioxide (CO2) emissions “budget” of 3 000 gigatonnes (Gt) (the mid-point in a range of 2 900 Gt to 3 200 Gt) (IPCC, 2014), of which an estimated 1 970 Gt had already been emitted before 2014. Accounting for CO2 emissions from industrial processes and land use, land-use change and forestry over the rest of the 21st century leaves the energy sector with a carbon budget of 980 Gt (the midpoint in a range of 880 Gt to 1 180 Gt) from the start of 2014 onwards. From the forecast above, cumulative CO2 emissions from 2014 with reach 980 Gt in 2038. Yet in 2040, there is no sign of peak emissions. Further corroboration comes from the UNFCCC. In preparation for the COP21 from all the country policy proposals they produced a snappily titled Synthesis report on the aggregate effect of intended nationally determined contributions. The UNFCCC have updated the graphics since. Figure 2 of 27 Apr 2016 shows the total GHG emissions, which were about 17 Gt higher than the CO2 emissions from energy emissions in 2010. The graphic clearly shows that the INDCs – many with very vague and non-verifiable targets – will make very little difference to the non-policy emissions path. Yet even this small impact is contingent on those submissions being implemented in full, which is unlikely in many countries. 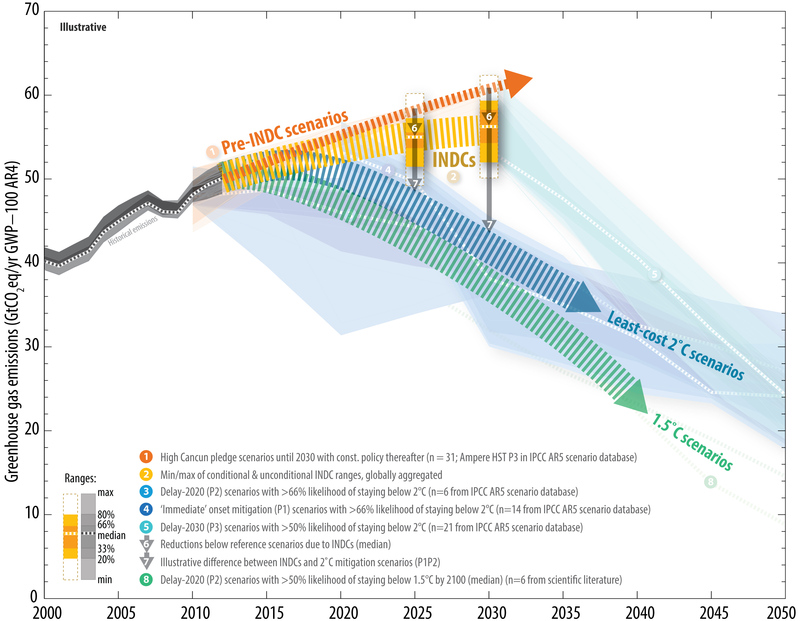 The 2°C target requires global emissions to peak in 2016 and then head downwards. There are no additional policies even being tabled to achieve this, except possibly by some noisy, but inconsequential, activist groups. 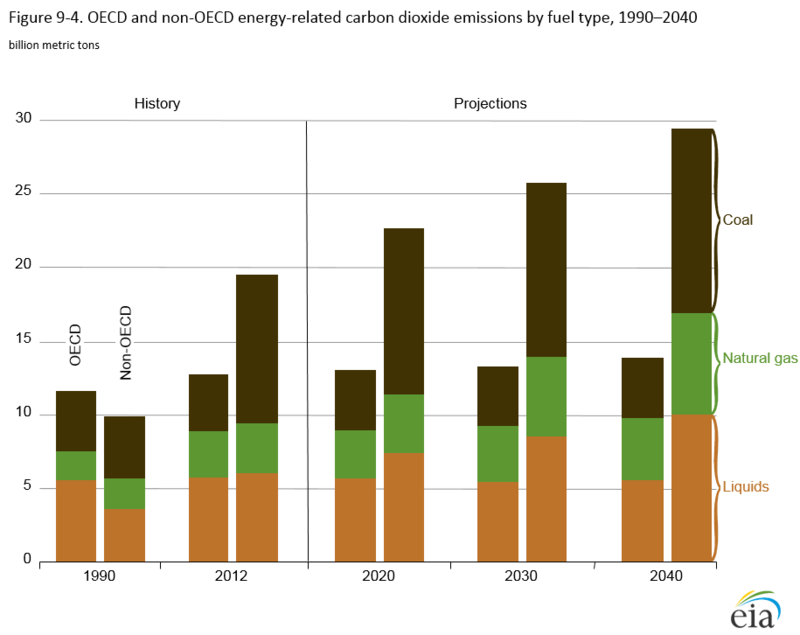 Returning to the EIA’s report, figure 9.4 splits the CO2 emissions between the OECD and non-OECD countries. The OECD countries represent nearly all countries who propose to reduce their CO2 emissions on the baseline 1990 level, but their emissions are forecast by the EIA still to be 19% higher in 2040. However, the increase is small compared to the non-OECD countries – who mostly are either proposing to constrain emissions growth or have no emissions policy proposals – with emissions forecast to treble in fifty years. As a result the global forecast is for CO2 emissions to double. Even if all the OECD countries completely eliminate CO2 emissions by 2040, global emissions will still be a third higher than in 1990. As the rapid economic growth in the former Third World reduces global income inequalities, it is also reducing the inequalities in fossil fuel consumption in energy production. This will continue beyond 2040 when the OECD with a sixth of the world population will still produce a third of global CO2 emissions. Unless the major emerging economies peak their emissions in the next few years, then reduce the emissions rapidly thereafter, the emissions target allegedly representing 2°C or less of global warming by 2100 will not be met. But for countries like India, Vietnam, Indonesia, Bangladesh, Nigeria, and Ethiopia to do so, with the consequent impact on economic growth, is morally indefensible. This is the first in an occasional series of illustrating the degeneration of climatology away from an empirical science. In my view, for climatology to be progressing it needs to be making ever clearer empirical statements that support the Catastrophic Anthropogenic Global Warming (CAGW) hypothesis and moving away from the bland statements that can just as easily support a weaker form of the hypothesis, or support random fluctuations. In figure 1 this progression is illustrated by the red arrow, with increasing depth of colour. The example given below is an illustration of the opposite tendency. Every major temperature data set shows that the warming rate this century has been lower than that towards the end of the end of the twentieth century. This is becoming a severe issue for those who believe that the main driver of warming is increasing atmospheric greenhouse gas levels. This gave a severe problem for the IPCC in trying to find evidence for the theory when they published in late 2013. Each of the last three decades has been successively warmer at the Earth’s surface than any preceding decade since 1850. In the Northern Hemisphere, 1983–2012 was likely the warmest 30-year period of the last 1400 years (medium confidence). The last three decades have been successively warmer according to the major surface temperature data sets. The 1980s were warmer than the 1970s; the 1990s warmer than the 1980s; and the 2000s warmer than the 1990s. The 1980s was warmer than any preceding decade from the 1850s. In the collective opinion of the climate experts there is greater than a 66% chance that the 1980s was the warmest decade in 1400 years. What the does not include are the following. That global average temperature rises have slowed down in the last decade compared with the 1990s. From 2003 in the HADCRUT4 temperature series warming had stopped. That global average temperature also rose significantly in the mid-nineteenth and early twentieth centuries. That global average temperature fell in 4 or 5 of the 13 decades from 1880 to 2010. That in the last 1400 years there was a warm period about 1000 years ago and a significantly cold period that could have reached bottomed out around 1820. That is a Medieval Warm Period and the Little Ice Age. That there is strong evidence of Roman Warm Period that about 2000 years ago and a Bronze Age warm period about 3000 years ago. Point (i) to (iii) can be confirmed by figure 2. Both the two major data surface temperature anomalies show warming trends in each of the last three decades, implying successive warming. A similar statement could have been made in 1943 if the data had been available. In so far as the CAGW hypothesis is broadly defined as a non-trivial human-caused rise in temperatures (the narrower more precise definition being that the temperature change has catastrophic consequences) there is no empirical support found from the actual temperature records or from the longer data reconstructions from proxy data. The major statement above is amplified by the major statement from the press release of 27/09/2013. It is extremely likely that human influence has been the dominant cause of the observed warming since the mid-20th century. The evidence for this has grown, thanks to more and better observations, an improved understanding of the climate system response and improved climate models. This statement does exclude other types of temperature change, let alone other causes of the temperature change. The cooling in the 1960s is not included. The observed temperature change is only the net impact of all influences, known or unknown. Further, the likelihood is based upon expert opinion. If the experts have always given prominence to human influences on warming (as opposed to natural and random influences) then their opinion will be biased. Over time if this opinion is not objectively adjusted in the light of evidence that does not conform to the theory the basis of Bayesian statistic is undermined. The greenhouse gas effect is no longer emphasised. It is now the broader “human influence”. The previous statement was prepared to associate the influence with a much longer period. Probably the collapse of hockey stick studies, with their portrayal of unprecedented warming, has something to do with this. Conversely, the earlier statement is only prepared to say that since 1750 the net effect of human influences has been one of warming. The more recent statement claims a dominant cause of warming has been human caused. This leads my final point indicating degeneration of climatology away from science. When comparing the WG1 SPMs for TAR, AR4 and AR5 there are shifting statements. In each report the authors have chosen the best statements to fit their case at that point in time. The result is a lack of continuity that might demonstrate and increasing correspondence between theory and data. The IPCC says that the cost of taking action to keep the rise in temperature under 2 degrees C over the next 76 years will cost about 0.06% of GDP every year. The figure of 0.06% of GDP (strictly Gross World Product) seemed a bit low. So I looked up the source of this quote. Estimates of the aggregate economic costs of mitigation vary widely depending on methodologies and assumptions, but increase with the stringency of mitigation (high confidence). Scenarios in which all countries of the world begin mitigation immediately, in which there is a single global carbon price, and in which all key technologies are available, have been used as a cost-effective benchmark for estimating macroeconomic mitigation costs. (Figure 3.4). Under these assumptions, mitigation scenarios that are likely to limit warming to below 2 °C through the 21st century relative to pre-industrial levels entail losses in global consumption —not including benefits of reduced climate change (3.2) as well as co-benefits and adverse side-effects of mitigation (3.5, 4.3) — of 1% to 4% (median: 1.7%) in 2030, 2% to 6% (median: 3.4%) in 2050, and 3% to 11% (median: 4.8%) in 2100, relative to consumption in baseline scenarios that grows anywhere from 300% to more than 900% over the century. These numbers correspond to an annualized reduction of consumption growth by 0.04 to 0.14 (median: 0.06) percentage points over the century relative to annualized consumption growth in the baseline that is between 1.6% and 3% per year. Matt McGarth (or a press officer) has wrongly assumed that 0.06% of GDP is the reduction in output, whereas the Synthesis Report talks about a reduction in growth rate. At any rate of growth, the impact of .06% reduction in growth rates will mean output in 2100 will be 4.8% lower. We can put a monetary impact on this through to 2090. The World Bank estimates global output was $74,910 billion in 2013. To keep the figures simple I will assume that 2014 will be $75,000 bn. The figures are below for 2090. With 1.94% growth global output in 2090 will be $323,038bn, about $14,774bn less than if there was 2% growth. Cumulatively a 0.06% reduction in growth would be $369,901bn. But a cost of 0.06% each year of global output, with 2% growth is a mere $8,087bn. Misstatement of the UNIPCC’s position understates the cumulative cost by 45.7 times. Similarly, with 2.94% growth global output in 2090 will be $678,356bn, about $30,716bn less than if there was 3% growth. Cumulatively a 0.06% reduction in growth would be $644,144bn. But a cost of 0.06% each year of global output, with 3% growth is a mere $13,107bn. Misstatement of the UNIPCC’s position understates the cumulative cost by 49.1 times. The BBC or the UNIPCC needs to issue a correction. The UNIPCC have at last recognized that policy will effect economic growth. It is way too low, particularly for the high-policy countries who are put at an economic disadvantage relative to those countries without policies. Now they need to also look at the additional estimated costs of low carbon energy, along with the hidden costs of regulation and failed policies. Thanks to Joanne Nova for highlighting the quote. Thanks to Tom0Mason for pointing out the following graphic SPM.3 at from the UNIPCC AR5 WGII report. This graphic implies that the UN has the ability to tell governments what to do. You all voted for that didn’t you? Yes the UN minions have set themselves up as identifiers of risk, assessors of risk, establishers of decision-making criteria, and implementers decision and then they’ll monitor you compliance. I am not sure that I entirely agree. The UNIPCC might have set themselves up as telling governments what to do, but they only partially heed what they claim in the chart, and governments even less so. For instance on “scoping“, the identification of risks and vulnerabilities is only partially followed through. In AR4 the UNIPCC scrapped around for every possible risk they could find, and then embellished them. They later admitted the Himalayan glaciers were fabricated, but there was nothing on similar fabrications for crop failures in Africa or for the collapse of the Amazon Rainforest. Nor was there an admission that claims of increasing hurricane activity were unsupported; or that the vanishing snows of Kilimanjaro were not from rising temperatures . The process of scoping should include categorizing risks according to magnitude, likelihood and the quality of the evidence. But no such critical evaluation takes place. In practice (with the UK as an example) implementation is accompanied by an enforcing agency whose monitoring consists of justifying the policy, with no independent audits of the success of the policy, nor identifying any adverse consequences. As a result the reviews to not learn from mistakes, nor how to improve the quality of policy, nor how to take into account new evidence, nor to consider the increasing evidence that the optimal policy is to do nothing.